SECESSION is a nasty business. A century and a half ago, America fought a civil war to prevent it. So it is not surprising that Spain, which has bad memories of its own civil war, should oppose independence for Catalonia. Spain’s refusal to allow a referendum on the issue is, however, matched by Catalonia’s determination to hold one—hence the vote the regional government held on November 9th, in which 80% of those who participated voted for independence (see article). The government in Madrid called the vote illegal, and a failure because turnout was only 37%; the Catalan one said that it demonstrated the case for Catalonia’s independence. Neither is right. The case for holding a referendum is strong, but if there is one, Catalonia should vote to stay part of Spain. The Popular Party government under Mariano Rajoy is holding firm to the position that, under the 1978 constitution, no referendum can be held at all. That line owes something to the government’s desire to win nationalist votes in next year’s Spanish election, but it also springs from genuine fear about what would happen to Spain if Catalonia peeled off. Catalan nationalists have drawn strength from the Scottish referendum earlier this year, but Catalonia is not Scotland. In relation to the rest of Spain, it is twice as big, with around 16% of the country’s population. It is also much richer, contributing almost a fifth of GDP and, unlike Scotland, transferring substantial sums to the rest of the country. Moreover, Spain has other restless regions: were Catalonia to go, so might the Basque Country and Galicia. Catalan independence would thus pose a serious risk to Spain’s very existence. Yet there are both principled and pragmatic reasons why the government should permit a vote. On the first, it is right to be cautious about breaking up countries, but when a region is a recognisable cultural, ethnic or linguistic entity, outright refusal to allow a vote is perverse. It would have been wrong to force Slovakia to remain in Czechoslovakia or Kosovo in Serbia, just as it was wrong for Britain to fight Irish independence. It would be just as wrong to make Flanders remain Belgian, Quebec stay Canadian or Scotland continue to be British, if a clear majority of voters preferred independence. The pragmatic case for a referendum is that, until recently, polls suggested that fewer than half of Catalans wanted independence, but a huge majority believed they should have the right to choose. The evidence is that, by rejecting the second demand, Madrid is helping the separatists. So the government should let the Catalans have a referendum. It should set some conditions, such as a minimum turnout of 80%, and maybe even a second vote, three years later. As Canada did with Quebec in its 2000 Clarity Act, it should insist on a fair process in any vote—a clear question that gets a clear answer, in other words. It should then devote its energy to persuading the Catalans to stay. As with Scotland, this newspaper would be on that side of the argument. Catalonia cannot plausibly claim to be a victim of central-government oppression. Catalan business and finance has benefited from being part of Spain, whose economy once again is growing. Excessive Catalan nationalism is more of a danger. It has already damaged the publishing and media industries in Barcelona. And secession would also raise doubts about Catalonia’s continuing membership of the European Union (and the euro). The Spanish government could do plenty to persuade Catalonia to stay—as the British government belatedly did with Scotland. It should restore the powers that were ruled against by the Spanish constitutional court in 2010. It should also promise a constitutional convention that looks again at the distribution of powers agreed on in 1978. Spain is already the most devolved country in Europe. But although spending is often done at regional level, policies are frequently still laid down in Madrid. And powers of taxation could also be re-examined. As the opposition Socialists are hinting, a federal structure modelled on Germany’s might suit both Catalonia and Spain. 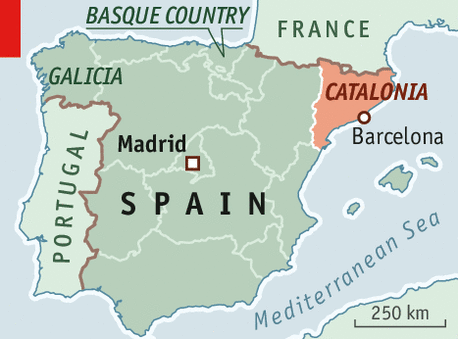 With an imaginative government at the centre, Catalonia might well vote to stay with Spain. But the issue now is whether Mr Rajoy wants to treat voters as grown-ups who can be trusted to decide sensibly about their own political future. By refusing even to contemplate a referendum for Catalonia on independence, he is failing to do that.